If you love to celebrate Chinese New Year, you will love these free, fun, and festive Chinese New Year Printables that I have been designing and sharing on my blog over the years. Chinese New Year is the most important of the traditional Chinese holidays. In China it is known as the Spring Festival marking the end of the winter season. The festival begins on the first day of the new lunisolar year and ends with the Lantern Festival on the 15th day. It is one of several Lunar New Years celebrated in Asia. The Chinese New Year is based on a traditional Chinese lunisolar calendar whose date indicates both the moon phase and the time of the solar year. A lunar month is around 2 days shorter than a solar month. In order to “catch up” with the solar calendar, an extra month is inserted every few years. This is why the Chinese New Year falls on a different date each solar calendar year. The years are marked by one of a repeating cycle of twelve animals. In order they are: Rat, Ox, Tiger, Rabbit, Dragon, Snake, Horse, Goat, Monkey, Rooster, Dog, and Pig. I’ve made printables for the Year of the Dog (2018), Year of the Rooster (2017) and Year of the Monkey (2016), make sure you check back every year for updates! As always, my free printables are available in two paper sizes – A4, and US Letter (8.5 x 11″). Some of the printables are also in A3 or 12×12″ size – for these special printers will be required, or you are welcome to print at a print shop. All of the links open up in a new tab/window so that you don’t lose your place on the list! Chinese New Year Lanterns – updated! Paper Hand Fans – updated! 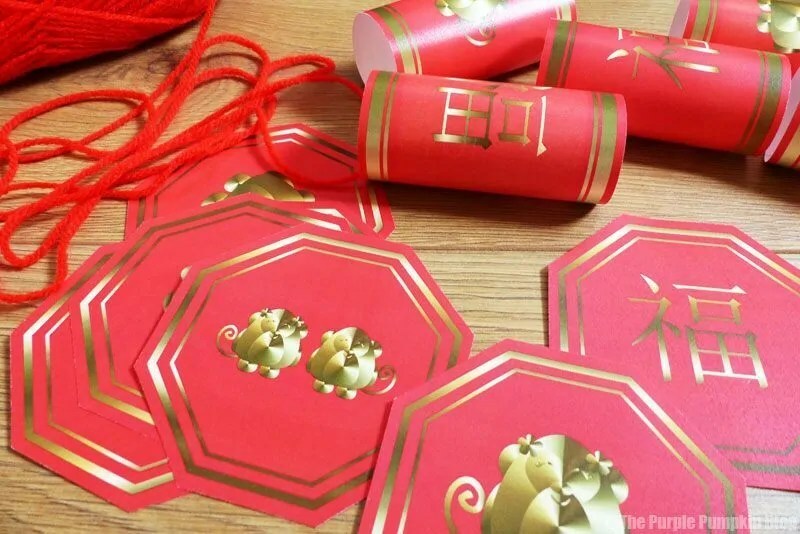 Chinese New Year Firecrackers – updated! Chinese New Year Wrapping Paper – updated! Red Money Envelopes – updated! Printable Chinese Take Out Boxes – updated! Place Cards for Chinese New Year – updated! I’ve put together a list of crafting supplies you might need to make and assemble these Chinese New Year Printables. Please feel free to share these Free Chinese New Year Printables by using the social buttons at the bottom of this post! Don’t forget that you can join The Pumpkin Patch for member exclusive freebies, offers, and more; and follow The Purple Pumpkin Blog posts on Feedly or on Bloglovin’ so that you don’t miss out!